Everywhere marketers turn these days, people are talking about customer experience. We’re supposed to make sure customers are happy throughout the customer life cycle. Our brands are judged by customers, but when one customer decides to take up his or her pitchfork and demand justice, what do we do? The first thing we have to look at is defining what “customer experience” really means. To do this, I’m going to use our own company as an example, and how we learned (and continue to learn) lessons about how to measure and improve the customer experience. Most of us equate customer experience with the process of needing and getting help. We all have had the experience of calling, emailing, or filling out a form for help, only to be forced to wait, be given inaccurate information, or upsold (“well, if you were a premium member, we would could help you…”). Consider what this means for your business. Can you dedicate the resources to helping people accomplish whatever it is you are trying to solve for them? Can you set up internal software and process (all connected to your CRM, of course) to ensure that when people need help, they get it? If you can, you differentiate yourself. Many companies, especially big companies, drop the ball on service. Use that to your advantage. From the very beginning, we have always had a strong in-house (i.e., not outsourced) customer service team. When you call, you get a real person. When you go on chat, you get a GreenRope employee. When you email, someone gets back to you. When you fill out a ticket, you always get a response within an hour during the business day. Almost half of our company is in customer service, a decision that was made on purpose. It’s something that has set us apart. The predecessor to GreenRope was an email marketing company called CoolerEmail. Back in our early launch days, around 2001, the idea of customer experience was new. People had low expectations of software and were used to reading manuals to figure out how to do things. Fortunately, email marketing itself is a simple concept. Build, send, and track your email and you’re done. People now expect to jump into software – any software – and be able to use it without referring to a manual. This presents a challenge to designers and developers alike. How do you make everything so simple? What if you’re creating something more than a simple one-trick pony kind of application? 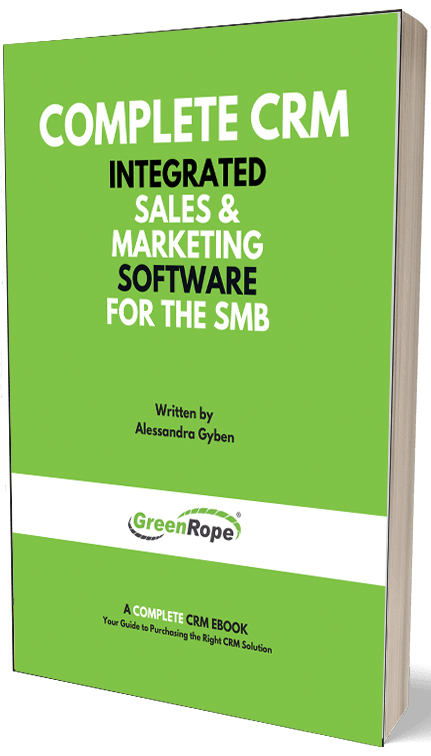 When we created GreenRope, we wanted it to be an evolution from simple email marketing to what we call “Complete CRM”. To us, this means providing a CRM with email marketing, events, projects, social, wiki, customer service, and more, all linked together and connected to automation and predictive analytics. Hardly a one-trick pony. When we launched our feature-rich system, the first users gave us almost all the same feedback – “it’s overwhelming”, and “we don’t know where to start”, and “I’m not ready to do this for my business.” It was disconcerting. We had worked hard for years and built something only the most advanced marketers could understand! So we went back to the drawing board. We found a local company that specializes in user interface design and worked with them to totally redesign our interface. It made a huge difference. Immediately after we launched it, the number of support tickets dropped by 50%, and within a few months, our churn had dropped by 60%. But we weren’t done. We still knew we could do better. CRM, no matter how you slice it, is a complex thing to get up and running in your company. You have to understand your data model, market segments, and internal processes BEFORE you go about implementing any software that affects all of those things. So we decided to change our business model a little. We started charging a setup fee and required all new clients to receive at least 3 hours of onboarding. A few people complained, but we found this accomplished two things for us. First, the setup fee dissuaded the “tire kickers” who were just poking around and not serious about getting CRM and marketing automation set up for their business. Second, and most important, we engaged an educational experience with people coming on board. What we found was that a lot of the challenges with CRM actually have nothing to do with CRM at all. It was about understanding how to set up your business FOR a CRM. Since most small businesses can’t afford a full time, dedicated CRM expert on staff, we had to make up for that with education to bring everyone at the client’s business up to speed. That created an interesting realization for us. Customer experience was affected by something that was totally outside the scope of what we thought we offered. When we thought of ourselves as a CRM software company, we were missing what we really offered, which was a new way of doing business. We don’t sell software. We sell a revolution in thinking about how business is done. Since making this change to our onboarding process, the customer experience is night and day. We find that those who take the time to go through our training are 9x more likely to stay on as clients for over 12 months. When we launched our email marketing product, we wanted anyone and everyone to use it. It was a simple application, and pretty much every business and organization wants or needs to send emails to communicate with their leads and clients. Because of its simplicity, the application could easily be adopted by a single person. Upload your list, design your email, click to send. Complete CRM is much, much bigger than that. But we thought since everyone needs a CRM, we should make it easy for someone to sign up for a trial account. They could demo the system and pay for it all at once. We had many, many people sign up for trials (including fun ones from Lagos, Nigeria) who tried to hack the system, send out spam, use stolen credit cards, and worse. The unqualified leads flowing into our sales funnel were overwhelming for our small staff. Much time was wasted. So we intentionally closed down the funnel. At first, I had a lot of trepidation about it. Our competitors offered free trials without any pre-qualification. What would happen if we no longer offered it? The result was revolutionary. Overnight, the number of bad leads coming into our funnel dropped to almost nothing. We still had people filling out forms who had no business getting a CRM, but it was easy to pre-qualify them and get them out of the sales funnel. Conversion rates climbed through the roof. The change in the way we do business changed our conversion rates from trial to paid from 11% to 40%. Those are the kinds of numbers everyone wants. We use our own CRM and marketing software to track our sales funnel, measuring conversion rates at each stage, and calculating the average amount of time to turn a lead into a client. The work of a software company is never “over”. There is always more to do. We have over 200 items on our to-do list, mostly requests for clients to manage a complex process. We have to be careful about how we build new features. They have to be totally thought out. Increasing capability without increasing complexity is no small feat. We recently sent a survey to our users (using our own built-in survey tool, of course) and by offering responders a 10% discount on their next month’s bill, we got a great turnout full of incredibly useful information. We used this feedback to help us rank order the priority of our to-do list items. Not only did it help us focus our efforts where they should be the most, it also demonstrated to our clients how important their feedback is. Customer experience is never a single touch point to any of your leads and clients. Follow your people, internal and external, through their journeys and measure what is working and where you can improve. Dedication to a positive customer experience builds brands. Yours should be one that stands out as a brand to love, not by accident, but by design.